The Roccat Vulcan 120 Aimo is one of the best gaming keyboard we’ve ever used. It’s a joy to game and type on, and it has a stunning design that proves that gaming peripherals can be stylish as well. Roccat has been dutifully making excellent gaming keyboards for a while now, but in a market that’s getting ever more competitive, how do you stand out from the crowd? With the Vulcan 120 Aimo, which has launched at Computex 2018, Roccat aims to do just that by combining its experience, build quality and a striking design that’s unlike any gaming keyboard we’ve seen before. It seems like the company is playing to its strengths, and that’s always welcome. On the box of the Roccat Vulcan 120 Aimo, it proudly says “German Design & Engineering." And, while it’s eye-catching design will certainly be getting a lot of attention, there’s also some finer details that Roccat has lavished on the Roccat Vulcan 120 Aimo in a bid to make it one of the best gaming keyboards money can buy. But, has it succeeded? Roccat has told us that the Vulcan 120 Aimo will be sold in late Q3 of 2018, and it is available to pre-order now. There will be the Vulcan 80, which does not include the customisable LED backlighting (it is just a single color), nor a wrist rest, and that will cost £119 (around $160, AU$200). There’s also the Vulcan 100 Aimo, which doesn’t come with a wrist rest and costs £139 (around $190, AU$250). Finally, the Vulcan 120 Aimo that we review here will be sold for £149 (around $200, AU$260). This puts it at around the same price as the Logitech G513 at £159 ($149, about AU$200) and other mid-range gaming keyboards like the $159 (£159, AU$215) Corsair K70 LUX RGB and $149 (£149, AU$189) Cooler Master MasterKeys MK750. The design of the Roccat Vulcan 120 Aimo is, quite simply, stunning. As soon as we saw it, we loved the look. In many ways, the design is quite conservative for a gaming keyboard. There’s a brushed aluminium body, and the seemingly obligatory RGB back lighting, but one small difference really makes this keyboard stand out. And that is the keys themselves. 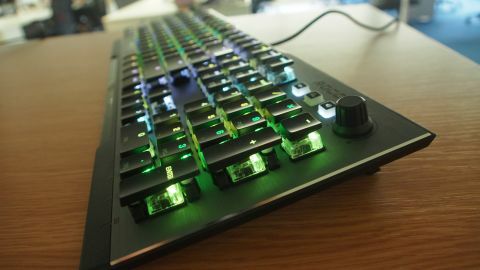 Unlike other keyboards that have key caps that cover the entire key, including the switch, the Roccat Vulcan 120 Aimo only has keycaps over the top of the key, leaving the rest exposed. It’s a small design tweak that makes a huge difference, giving the Roccat Vulcan 120 Aimo an industrial-like feel as the mechanical parts are exposed, while also giving a hint of retro cool that's similar to old typewriters. It certainly doesn’t look old fashioned, however, as those RGB LEDs which light up each individual key look even more striking as they glow around each key, as well as through the top, as the switches themselves are transparent. There’s no dedicated macro keys on the Roccat Vulcan 120 Aimo, which some people may miss, but we think helps keep it from feeling cluttered. Instead, macros can be assigned to the F1, F2, F3 and F4 keys. There is a dial knob in the top right-hand corner of the keyboard. Next to it are three buttons. One mutes the volume of your device. The next button is the ‘FX’ button. Pressing this, then twisting the knob lets you scroll through the various lighting options. There is also a volume button, and pressing this lets you use the knob to control sound volume. It also comes with a wrist rest you can attach to it. It’s a nice addition, but it’s made of rigid plastic, which means it’s not as comfortable to use as a padded wrist rest. In the end, we swapped it out for a wrist rest we’d previously been using. It’s the one misstep in an otherwise flawless design. Roccat is yet another company that has dropped the popular Cherry MX mechanical switches for its own, with the Roccat Vulcan 120 Aimo using Roccat Titan switches. These have a 1.8mm actuation point, and are probably most similar to Cherry MX Brown switches. So, you get a tactile switch that feels light and fast. The half-weight caps on the keys don’t just give the Roccat Vulcan 120 Aimo a striking look, it also allows the keys to return to their position much faster. It’s not as loud or ‘clicky’ as some mechanical keyboards are, but the quickness of the switches makes it a fantastic keyboard for typing on, as well as a very good gaming keyboard. According to Roccat the electrical bounce time of the keys is reduce by 20%, compared to Cherry MX Switches, to 4ms, and it results in a very responsive feeling keyboard that can keep up with frantic typing, as well as fast-paced action in games. This means the Roccat Vulcan 120 Aimo is an excellent keyboard if you use your PC for working on as well as playing games. While the Roccat Titan switches aren’t quite as good at gaming as Cherry MX Red switches, the Red switches aren’t always great for typing on. The Roccat Vulcan 120 Aimo feels much more well-rounded in that regard. Overall, we are very impressed with the Roccat Vulcan 120 Aimo. Its design is absolutely gorgeous, and we love the way it does something different with RGB lighting. The half-capped keys are a masterstroke that really makes the keyboard stand out, and there are practical benefits to it as well, with the keys being lighter and faster. The Roccat Vulcan 120 Aimo also performs brilliantly in both gaming and typing, as it feels fast and responsive with an actuation point that is not too shallow, and gives you tactile feedback when pressing the keys. It’s not the loudest mechanical keyboard we’ve tried, which will please anyone who sits near you when you type and game. It is expensive, but you’re getting a fantastic and versatile keyboard that looks fantastic. We really can’t say enough good things about its design. It’s just a shame that we find the wrist rest to be not as comfortable as cushioned ones, but that’s a minor complaint, really.